Yay for a savoury DB challenge! I know this is only my second challenge but I was delighted to be making something savoury this month. I was equally delighted to have an 'alternative' challenge. 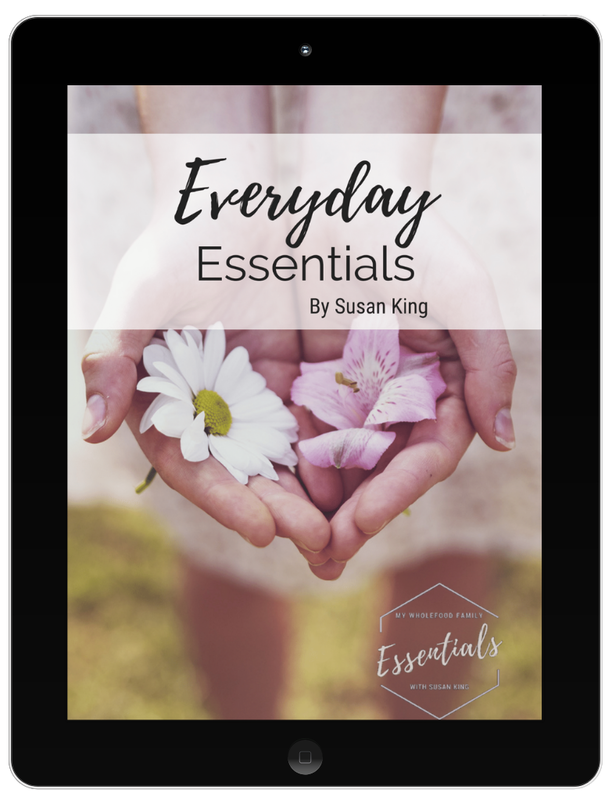 I've had lots of problems with food allergies over the years and I know how frustrating it can be trying to find something you can eat at parties etc. 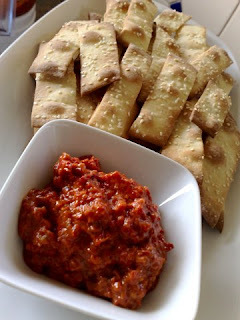 This was a two-part challenge - first to make Lavosh crackers (either regular or gluten-free) and then to create a vegan dip to go with the crackers, and that was a little trickier! I decided not to go for a gluten-free cracker here purely because I didn't have the ingredients. The regular flour recipe was an absolute breeze. I even kneaded it by hand (usually I cheat and use the dough hook in my mixer) and it took a full 15 minutes to meet the stretch and windowpane tests. I used my pasta maker to roll out the dough which allowed me to get a really even end result. I took it down to the second thinnest setting which made it a little easier to manage, then used a pizza cutter to make rectangles. The only frustrating part was having to do so many batches and waiting for the tray to cool down in between. I decided to keep them pretty plain, just sprinkling the tops with sesame seeds and some sea salt, as the dip I chose has a bit of kick. I don't make dips very often and it was quite difficult to find something that was actually vegan (meaning no animal products whatsoever) rather than just vegetarian. In the end I just decided to do Pesto Rossi, which means red pesto in Italian. It is actually a pasta topping but I though it would work well with the crackers. Blitz all ingredients in a food processor and serve. It really is that easy! To make a non-vegan variety you can add a 250g block of cream cheese into the mixer and process until smooth. This is great as a dip or over pasta. All the taste testers absolutely loved this and everyone wanted the recipe! A big thank you to Natalie from Gluten A Go Go and Shel of Musings From the Fishbowl for this month's challenge. 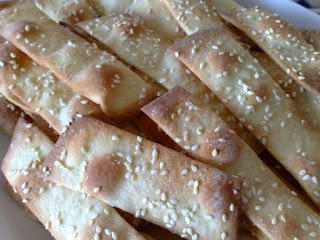 I really enjoyed it and will definitely be making these crackers again! Love your choice of dip - capsicums and tomatoes together taste great. Ooo, your lavash looks wonderful! The dip sounds great as well. Your lavash looks wonderful! I like the long rectangle shapes. The Pesto Rossi dip sounds delicious!